Join Certified Zentangle® Teacher Rosie Hill at Coos Art Museum on Saturday, March 17, 2018 from 1:30 pm to 3:30 pm for “Zentangle Reflections” Learn a striking, new design approach to Zentangle. We’ll create a tile that is half black, half white. We’ll add tangling, shading and highlighting resulting in a Zentangle and it’s reflection. Participants are to bring Micron 01, a pencil, scissors and a tortillion. Optional tools: a detail eraser and a corner punch. All other materials are included in class fee. 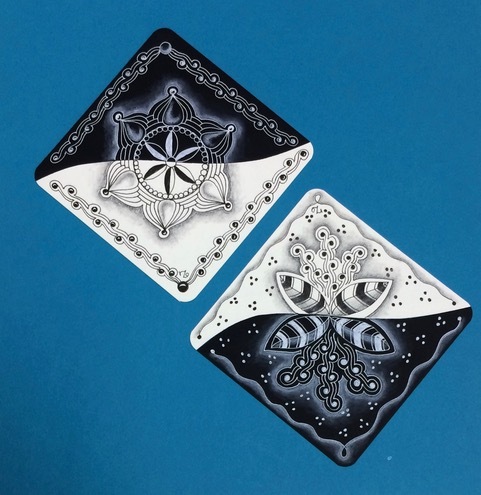 Zentangle books and other supplementary materials will be available for purchase. Teens and adults of all skill levels are welcome. Class size is limited to 12 participants. Class Fee: $30 CAM members / $35 non-members. Registration ends March 17, 2018. For registration go to www.coosart.org or visit Coos Art Museum at 235 Anderson in Downtown Coos Bay.